We love apples in my home. that crunchy sweet juicy fruit. I also use it for pancakes, pies, turnovers, fritters and salads. We go through a lot of apples. 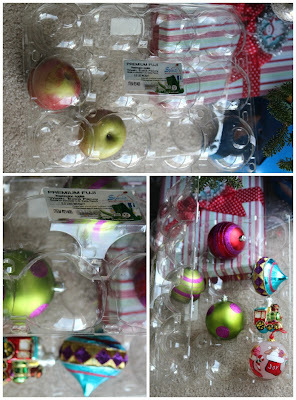 while I was emptying my apples from the protective plastic containers it came with from Costco. We normally just put the plastic container in our recycling bin. I'm taking to my our son's school this week." I told my husband. And reminded me that I already have a real cupcake transporter. Well, I said it would still be great to put cupcakes in it when you have to take it to a friends house and not worry about leaving the container. at my still up Christmas Tree. it's perfect for my christmas ornaments. but hey I did today. And while I'm at it, this would be great as an accessories organizer in my drawer. 3. Panna Cotta Mold - cut individually, pour panna cotta and chill. Do you have any more awesome ideas for reusing this apple plastic container?